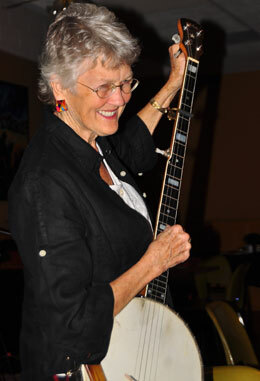 The daughter of composer Ruth Crawford Seeger and ethno-musicologist Charles Seeger, and sibling to Pete and Mike, Peggy Seeger grew up well schooled in American folk and European musical traditions. She learned to play piano, guitar, five-string banjo, autoharp, dulcimer, and concertina, and cut her first record at age 18. After several decades living and performing in England with the late Ewan MacColl, Peggy continues to tour the world with her amazing repertoire of traditional Anglo-American music as well as her own well-known activist songs, like the feminist anthem "Gonna Be an Engineer" and "The Ballad of Springhill." Peggy has recorded numerous solo albums, most recently the spare but powerful Bring Me Home (Appleseed). In 2010 she released Fly Down Little Bird, a wonderful collection of historical duo recordings made with her late brother, Mike.